We Pakistanis are a crazy lot when it comes to guns. I mean lets face it, we are really crazy about firearms, not only about collecting them but also shooting them, which is mostly in the air. I have already done a post on the menace of aerial firing, which in fact is a very dangerous thing. The availability of guns/ammo (Desi as well as Foreign) without much paper work and hassles, the unavailability of shooting ranges and our ignorance on the issue is what results in most people shooting their weapons in the air. Anyways, new firing ranges are now coming up in bigger cities, where people with licensed weapons can go to fire them and improve their shooting skills. 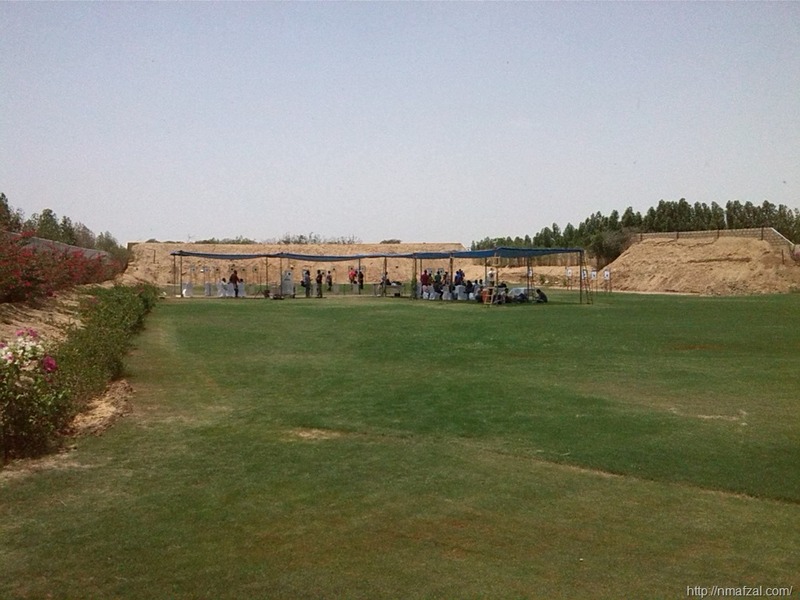 The Arabian Sea Country Club, Karachi has a shooting range for small arms, mostly pistols. It is located off N5 on the road leading to Pakistan Steel Mills Ltd. So it takes around an hour to get there depending on the time of day and traffic/road conditions. I have been going to this range for a couple of months and have found it to be a good experience. They have about 50 M space with separate firing stands for pistol shooting. But normally people fire up to a maximum of 25 M. The management has appointed a capable and competent Range Master who supervises the shooting. Their SOPs and procedures are quite refined. On Sundays one is sure to find lots of gun enthusiasts at the range, so it turns out to be a good activity. Not only can one practice but the interaction with other gun lovers also adds to ones knowledge. Since it is an outdoor range so in case of winds the shooting becomes very challenging. They have ample stock of targets and stands so one doesn’t have to wait a long time for his turn. To use the range you have to have a licensed weapon and range membership which is around Rs. 100,000. I think this is not a big amount considering the fact that people spend oodles of money on buying arms with no place to shoot them. It makes perfect sense to get a range membership instead of having no place to fire a gun and a cabinet full of guns. The only downside is the long drive, so on a Sunday that means at least 4 to 5 hours, that includes the commute to the range, firing and coming back. Thanks. You bet, the acrid smell of gun powder, the bangs and thuds, the flying brass cases out of a pistol, the soft and hard recoils, everything can be summed up in one word, “elation”. 🙂 Plan a visit and I can assure you it will be fun.